As I'm a work at home Mom doing online writing jobs several hours a day I need a space dedicated to working where I can think clearly and not be disturbed. 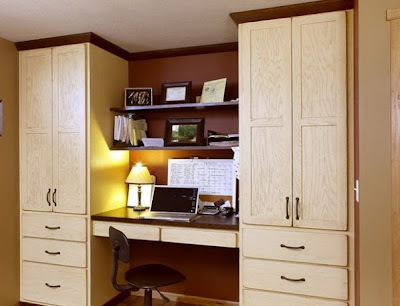 Since space is a luxury these days most home office are just made with creative ideas of maximizing home space while having a corner that you can use for your office. Those who are not working at home sometimes find the need also to work in their home after office so they can continue doing their unfinished tasks. Well got this 2 designs from architectureartdesigns.com with their release of 20 home office designs for small spaces. These are only sample ideas and for more designs you can go to their site for you to choose which of their designs are good for your lifestyle and needs. The second one will be just right for me when I want to work in our bedroom and I'll have to post another when I want to squeeze my home office near the living room.